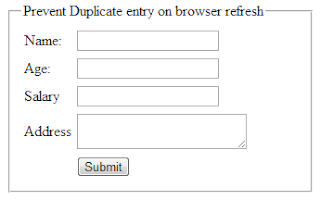 Introduction: In this article i am going to explain How to prevent/avoid/stop duplicate record entry insertion when page is refreshed by clicking on browser's refresh button in asp.net using C# and VB.Net languages.In previous articles i explained How to Disable browser autocomplete feature in TextBox and Retain password value in TextBox after postback and Get browser name,version,type, operating system and Get Title,Description and Keywords Meta tags from URL and Count and display remaining characters in the multiline textbox and Get current page URL/Address and Create log file to record errors and exceptions. Description: While developing input forms in Asp.Net many of the developers face a very common issue i.e. insertion of same/duplicate data on refreshing browser by clicking on refresh button or hitting F5. Browser display the above popup message on refreshing page. Reason: Whenever browser is refreshed it will resend the last request to the website, so when we click on refresh after submitting the record it will insert the new entry of duplicate data in the database. Redirect to another page after successfully submitting the form. Redirect to same page after successfully submitting the form. Check for already existing duplicate data before submitting record. Implementation: Let's discuss 3 these techniques using suitable example. The logic is simple. We need to check for the same entry every time before inserting a new record. If the same record is not in the database then it insert the record in the database otherwise not. So we need to create the Stored procedure to perform this. Note: On refreshing browser it will still show the "Confirm Form Submission" popup message but will not make duplicate entry. Thanks sheebu for your valuable comment..Stay connected and keep reading for more useful updates.